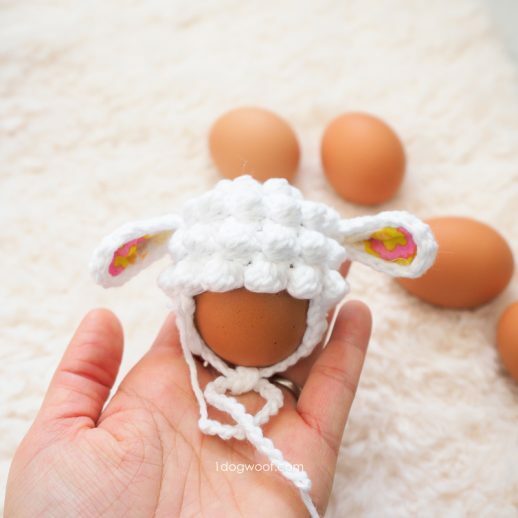 This simple project is made using Lion Brand Yarn’s Jumbo Alpaca Blend. 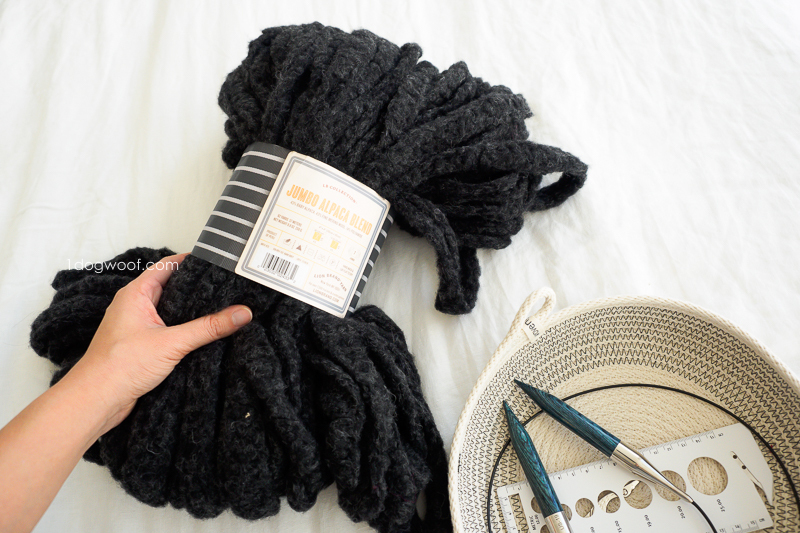 It’s a super chunky jumbo yarn and is listed as 7 on the Craft Yarn Council’s standard weight system. But an interesting thing about this yarn is that its not quite solid. If you look closely, you can see that it’s almost a mesh, kind of like a continuing ladder of yarn. I think this makes it lighter and stretchier than you’d expect. And it blocks amazingly well. 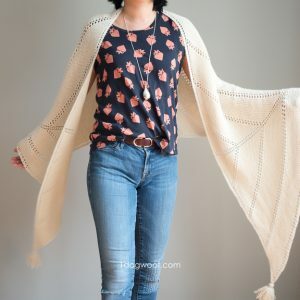 The knit stitches feel bulky when you’re working with it, but then when you wet block and lay it all out, you realize it has an incredible amount of stretch, and all of a sudden, the shape and stitches of the capelet all become clear. 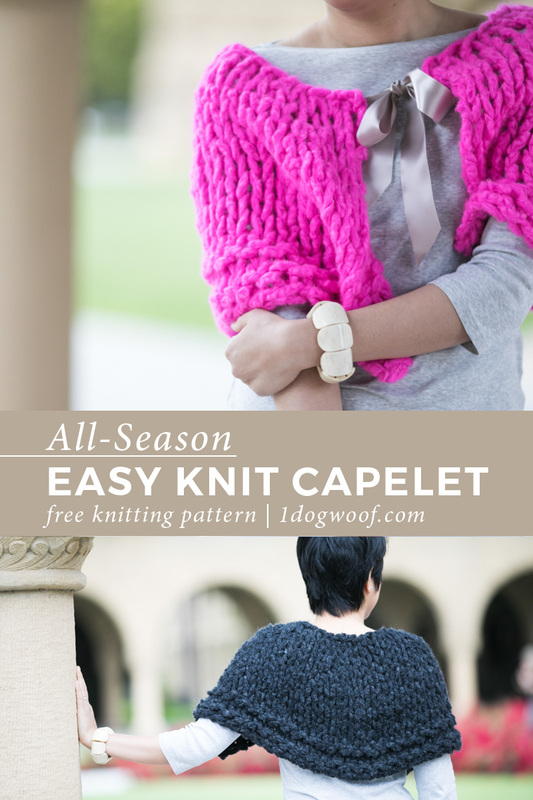 Because the yarn is so thick, this is actually a pretty quick and easy knit. It’s also a great way for you to try a bit of raglan shaping, where you separate the piece into 4 parts – front, back, and each shoulder. The front and back pieces increase in size, but the shoulders stay the same. Since each stitch is so large, there’s only 2 rows of raglan increasing, just right if you want to dip your feet into the raglan water. In the pattern, the stitch markers indicate the separation between the 4 pieces. The knit8 is the shoulder – you can see that it doesn’t change, even as the front and back increases using the “kfb” or knit front and back technique. 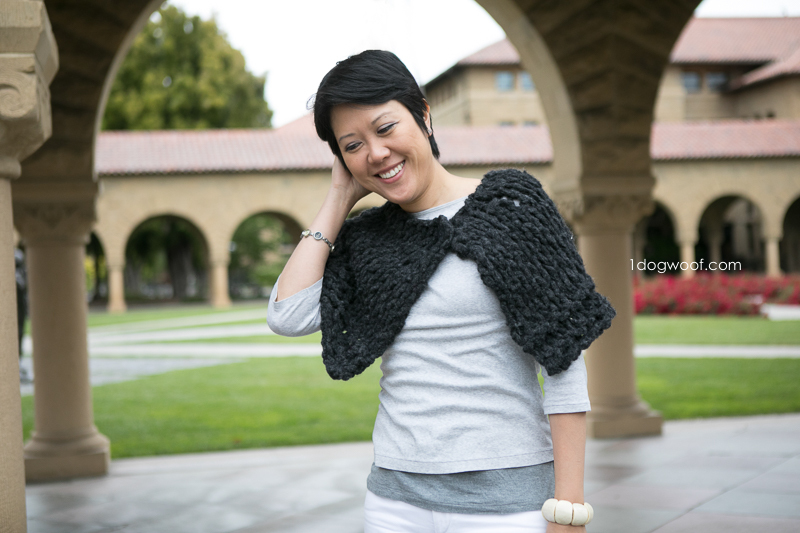 Once you’re finished with the capelet, you can choose to add a matching ribbon for a more formal look, or add a big button to keep things a bit more casual. I can see this garment coming in handy not just for special occasions, but also for those colder nights when you want warmth on your shoulders but not necessarily be covered or cocooned in a large blanket. Jumbo Alpaca Blend comes in a great colors – some neutral to match any outfit, and some itching to stand out against a little black dress. 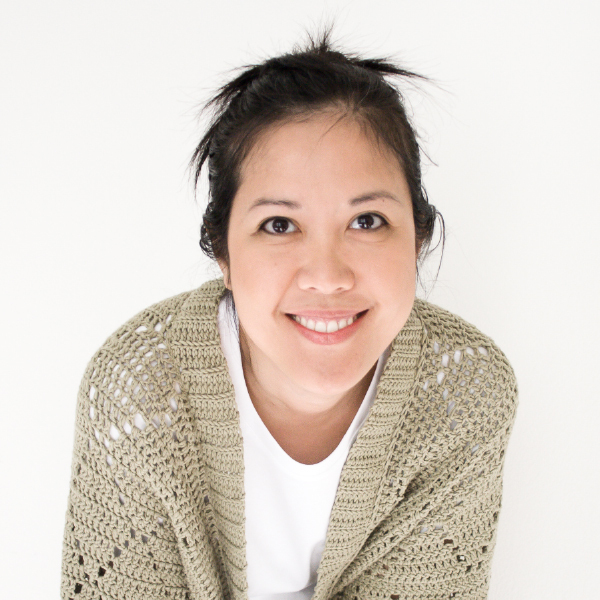 I made this capelet using one full skein of Jumbo Alpaca Blend. Because it’s a more expensive yarn, I kept it to one skein only, which means the pattern is one size only. It fits loosely on me, so I can see it fitting up to a size Large. Beyond that, you’ll need another skein of the yarn. If you’re interested in making a larger size, I’ve included some sizing notes below. 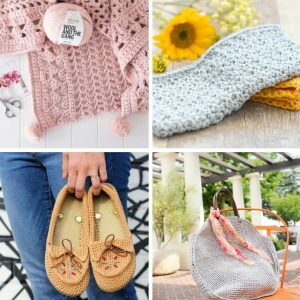 kfb – knit in the front and back. This is an increasing stitch, making 2 stitches out of 1. Blocked Gauge: 4 sts and 4 rows rows in 4 inches. Additional sizing: If you’d like to make the cape larger, you can continue the pattern from Rows 3-6. For example, adding one more increasing row would be Row 7: k5, kfb, k8, kfb, k10, kfb, k8, kfb, k5. Once you’re done with the increasing rows, work 6 (or more) rows of stockinette and 3 rows of garter stitch. 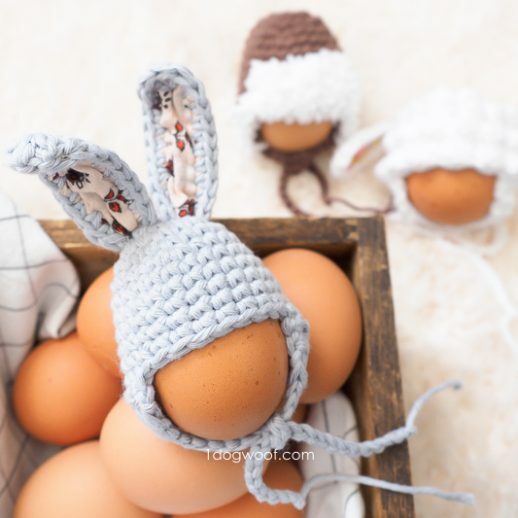 You can choose to sew on a ribbon closure, a button closure or others. No additional button hole needed if you choose to use button closures. The gauge itself is loose enough to double as button holes. Wet blocking is highly recommended. 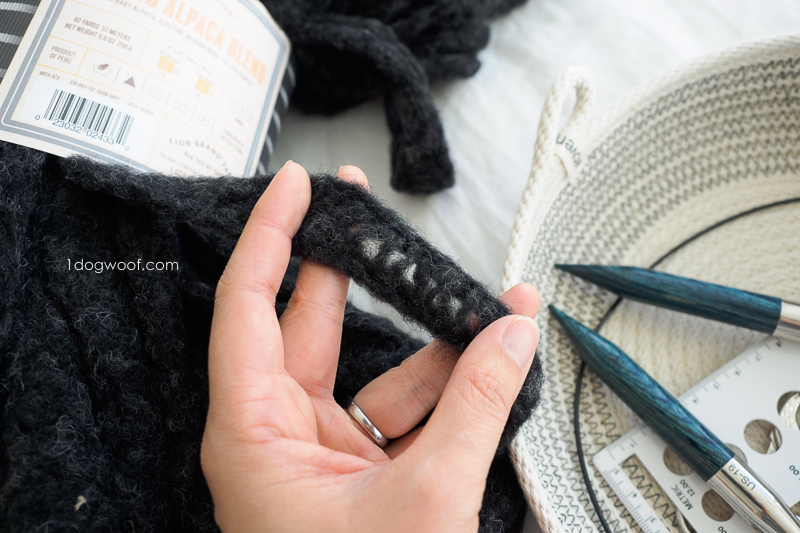 The yarn can handle a lot of stretch to give it the right length. Row 1: Cast on 32. 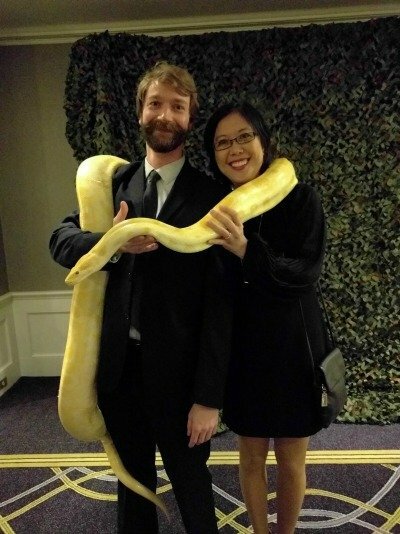 Oh yeah, here’s me, my husband, and a python. This was at part of the entertainment at one of his company’s holiday parties.